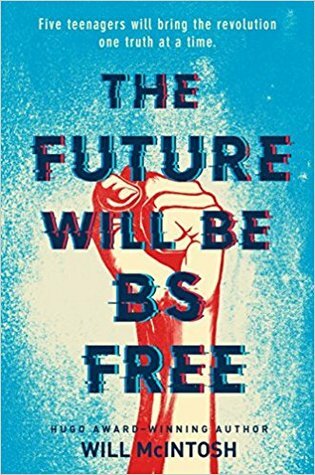 We're excited to have Will McIntosh with us to share more about his latest novel, THE FUTURE WILL BE BS FREE. Will, what was your inspiration for writing THE FUTURE WILL BE BS FREE? I was giving a test in the 300-student Intro to Psychology class I taught at William and Mary until recently. With so many students, you need at least two proctors, so a graduate student with a background in physiology was helping me. When the room was nearly empty, we got talking about future developments in her field. I asked if it might be possible to use a brain scan to tell when people were lying, and she told me about a part of the brain whose function was to resolve internal discrepancies. When people lie, that part of the brain is very active, and a brain scan, an fMRI, might one day be sensitive enough to detect this. That got me thinking about the implications of someone inventing a portable, foolproof lie detector. There's a scene where the brilliant teens who invent this portable lie detector realize that a lie detector not only makes it hard get away with lies, it also makes it hard to keep secrets. They sit around a bonfire and tell each other all of their secrets, to come clean so they don't have to fear their own invention. I gave my characters some painful secrets, and one secret that paints my protagonist in a very negative light. I risked making him unsympathetic to my readers, because I decided if I was going to write a book about lies and deception, the things that come to the surface shouldn't be easy to dismiss. It's not always an easy book to read. How long did you work on THE FUTURE WILL BE BS FREE? At this point in my career, I write quickly once I have a rough idea of the plot and characters. It took my about 5 months to write this one. What do you hope readers will take away from THE FUTURE WILL BE BS FREE? I hope it will lead readers to imagine what the world would be like if no one could lie, both the pros and cons. And in doing so, I hope it leads them to realize what a staggering role lies and deception play in the modern world. Writing is my full-time job now, so generally I write Monday to Friday, 9 to 5, with a break for lunch and exercise. I listen to music pretty much the entire time. Loud, driving music. A lot of people would find that distracting, but it works for me. I don't write quickly -- a really good day for me is 2000 words -- but the words pile up because I don't take many days off. I'm working on a middle grades book, a young adult book, a contemporary thriller, and a futuristic thriller. They're all at different stages. I keep the revolving door moving, so if I get stuck on one project, I can quickly shift to another. Will McIntosh is a Hugo award winner and finalist for the Nebula and eleven other awards. His most recent novel is Burning Midnight (Penguin Random House). His previous book Defenders (Orbit Books) was optioned by Warner Brothers for a feature film, while Love Minus Eighty was named the best science fiction book of 2013 by the American Library Association. Along with six novels, Will has published around fifty short stories in Asimov’s (where he won Reader's Awards in 2010 and 2013), Lightspeed, Science Fiction and Fantasy: Best of the Year, and elsewhere. Up next is Faller, a wild SF adventure novel to be published by Tor Books. Have you had a chance to read THE FUTURE WILL BE BS FREE yet? Has a conversation with someone sparked a story idea? Do you work on multiple projects at one time? Share your thoughts about the interview in the comments!